Nigerian R&B singer Henry Olusegun Olumide Adeola Samuel popularly called Seal has found new love months after he divorced his model wife Heidi Klum over infidelity. 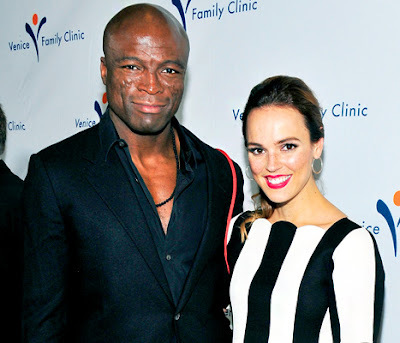 Seal‘s new girlfriend is actress Erin Cahill. Seal is 50 while Cahill is 30. I dont knw d reasson why most celebrities are infidel,is almost becoming a phenomenom. Gud on u seal,u got to move on and will see u at THE VOICE AUSTRALIAN 2013.Wish u best of luck mate. I hate to see this gay man called seal. We here in europe knows his useless lifestyle.He is a disgrace to black people. No be small, Kabaka u are right. He only dates white? So he can’t fall in love with a black woman for once or what? Phewwww. Seal and Erin Cahill together looking gud. Both are tall handsome and suits with each other.